It’s almost the 5th anniversary of one of the worst school shootings in America – The Sandy Hook. At this time of the year, while most of us are preparing for our joyous holiday celebrations, the families of Sandy Hook’s victims are having their moment of silence and pain, still. Months after the tragic incident, in Spring 2013, I designed a classroom safety apparatus I called LifeMor Pod and have the idea patented (USPTO Patent Filing No. : US 61/767,119 ; Confirmation No. : 2343). Below is the design’s description and technical illustrations which I’ve previously posted on my personal blog. I hope this idea can be considered as one of many inputs that we’re contributing toward the safety of our schools – the safety of our kids. 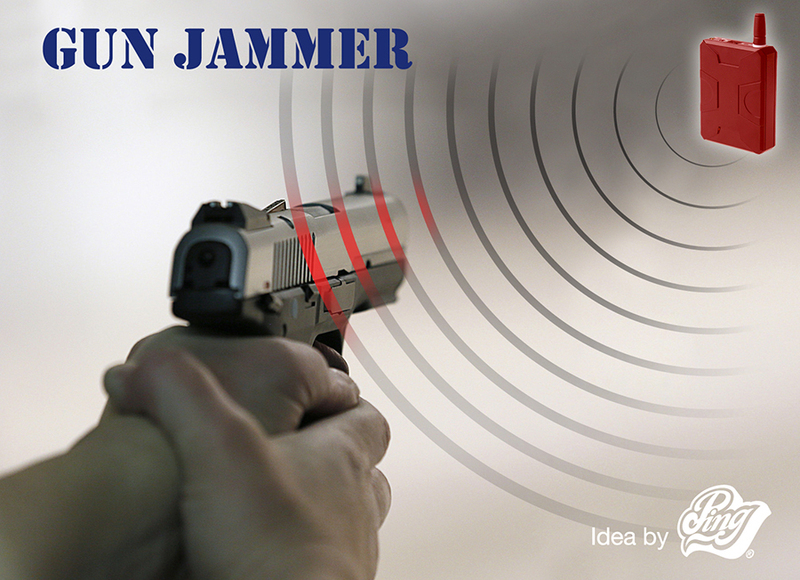 As the national gun debate continues to produce uncertainty. And the tragedies of gun-related violence at schools continue to taunt every parent, including me, I then came up with a design of a small bulletproof room. This portable room can be placed in every classroom to protect students. LifeMor Pod is a three-wall enclosed bulletproof structure with two entry doors, designed to save life in a situation of gun violent or active gun shooting – where people can take a safe refuge in it. LifeMor is a portable pod, placed inside classrooms, school cafeterias, libraries, gyms or else where; It also can be used in offices and/or public places to promote safety (eg. shopping malls, food courts, etc.). 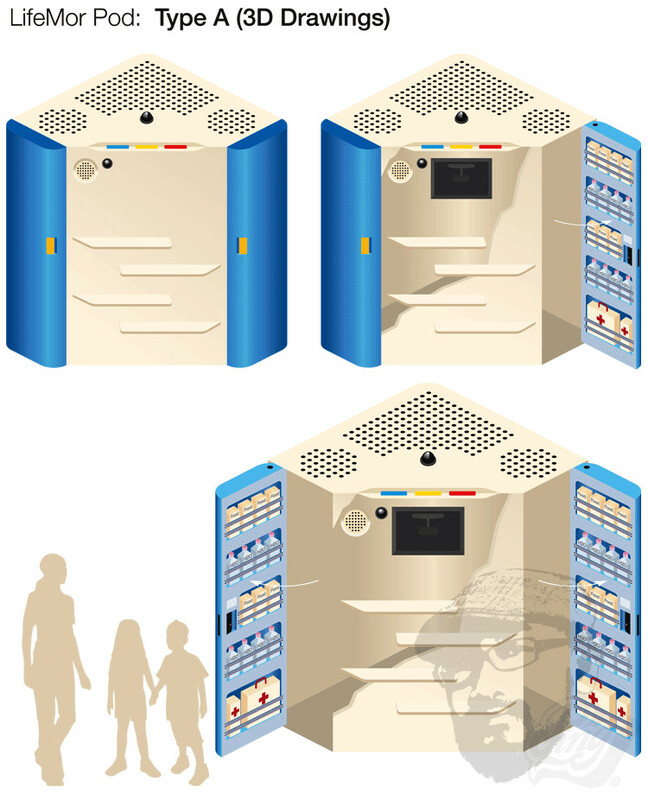 But the main purpose of LifeMor Pod is for school’s environments, that aims to protect students and/or to minimize casualties in a situation of gun violent – to avoid what recently happened in Sandy Hook Elementary School, Newtown, Connecticut. LifeMor is a computer-controlled pod. Its structure is built using light and sturdy bullet-proof materials, with two automatic doors – only will open during an emergency lockdown. The Pods come in two types of sizes (Type A and B). Each pod can accommodate a number of students of one class (20 to 25 students along with their teacher and assistant teacher): Type A (about 5.5’ X 5.5’) for kindergarten and/or elementary classroom; Type B (about 5.5’ X 8’) for middle school and/or high school classroom. 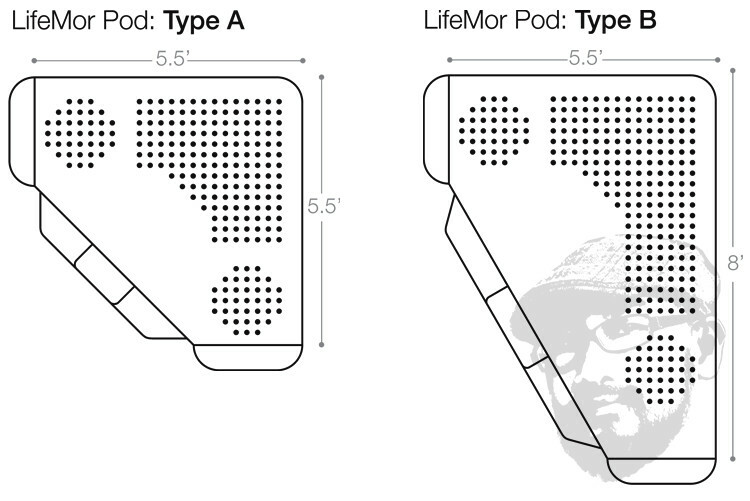 As a portable product, LifeMor Pod will be assembled at the locations (e.g. classrooms, labs, library, etc). The finished pods will be secured to the wall and floor. It will then be wired or wirelessly connected to the main activation/control location, e.g. principal’s/ school admin’s office and/or school’s security office – which also be two-way-connected to other hot-spots throughout the school’s building(s). 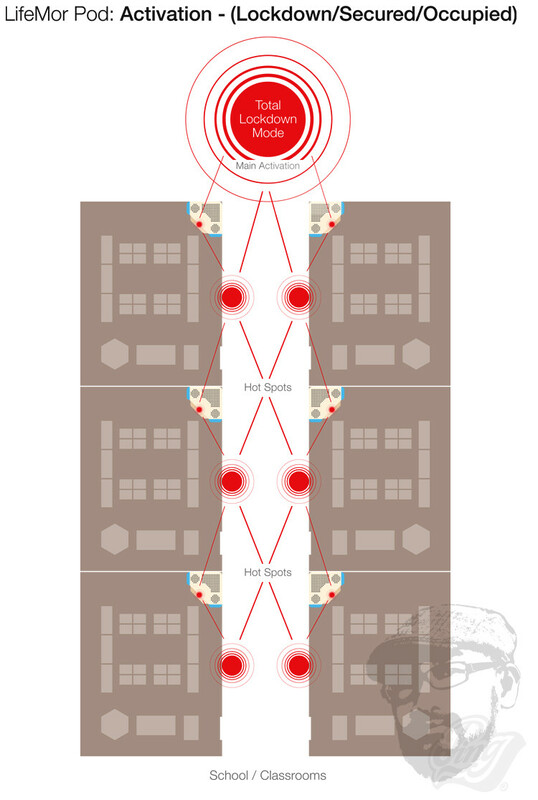 These hot-spots also can work as activation spots, will be placed at some key locations, such as next to the fire alarm boxes in hallways, library, cafeteria, gyms, etc. And they will be secured in tempered-proof boxes. LifeMor Pod should be placed at the back area of every classroom and will become a semi-permanent part of the room. It will need regular maintenance and monthly testing to ensure it works properly. 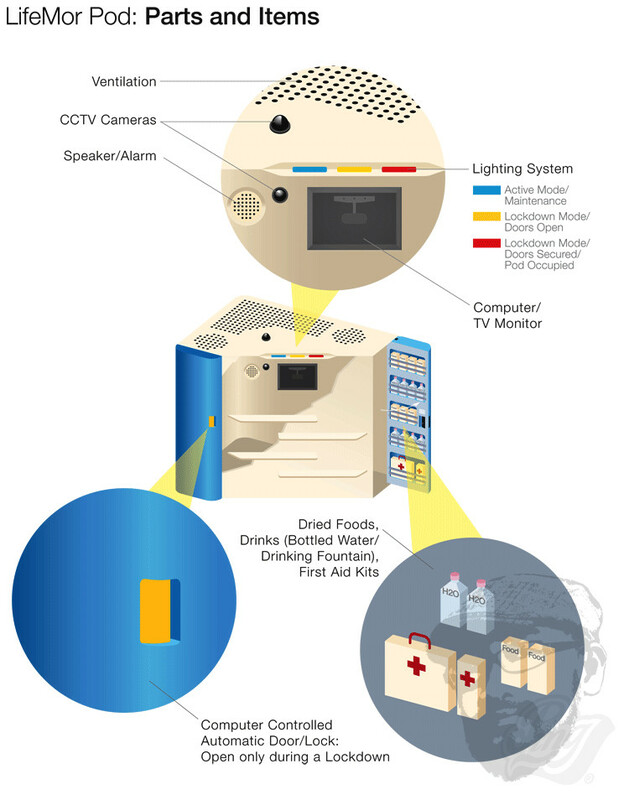 The Pod will be well stocked with dried foods, drinks (water-bottled or drinking fountain), and first aid kits; It’s also equipped with a lighting censor, CCTV cameras, air ventilation (AC), computer monitor, alarm and communication systems – to monitor outside situation and to enable a constant contact with police/authorities during an emergency situation/lockdown. I believe LifeMor Pod will be able to protect students and reduce casualties to minimum when gun violence occur in a school. School safety is numero uno!